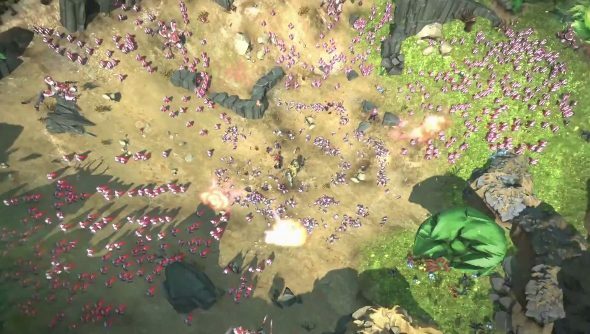 Gearbox has joined the increasingly large number of developers trying their hand at a MOBA. The studio’s first new IP since Borderlands is Battleborn, it’s been revealed in a Game Informer cover story, a first-person arena shooter with MOBA sensibilities. Warriors from across the universe, including an immortal samurai and a gun-toting robotic gentleman, all come together to battle over the last star in the sky. The FPS will include modes evocative of MOBAs, with the quick levelling and strategic depth of titles like League of Legends. Creep-like robots will duke it out through deserts and jungles as the players fight around them, as the match progresses. But while those elements are par for the MOBA course, Gearbox is also throwing in a five-player co-op campaign. Gearbox President, Randy Pitchford, offers his own description of his studio’s new game: “Battleborn is: FPS; hobby-grade coop campaign; genre-blended, multi-mode competitive e-sports; meta-growth, choice + epic Battleborn Heroes!” I’m sure the developer’s PR folk are going to have a blast trying to sum it up in press releases. While I’m not convinced the industry (or indeed the planet) can handle the weight of all these MOBAs cropping up, the trailer is at least rather lovely. Take a gander.